"I attended a workshop with Sheila Frampton-Cooper at Empty Spools, Pacific Grove, California. 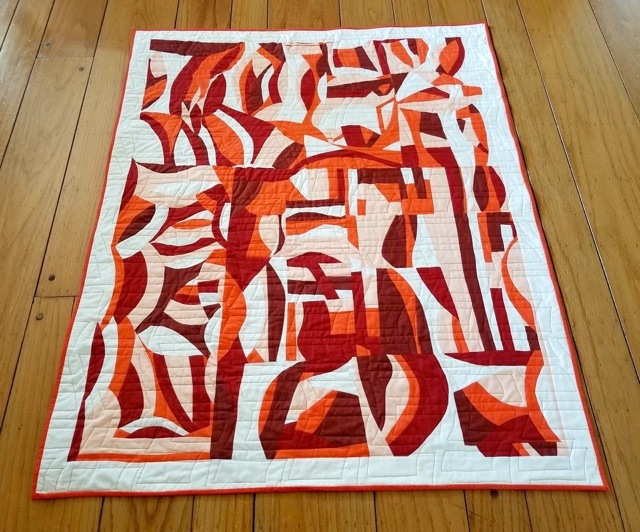 I was excited to learn a different method of quilting, and loved Sheila’s beautiful artistic quilts. Well, this definitely is far removed from traditional quilting and opened my eyes to a completely new technique. I must admit, at first I was intimidated. It seemed everyone was getting the technique down and creating something wonderful and I was still feeling my way. Sheila was reassuring and insisted to just keep going. After the workshop was over, I continued working my piece, making a few separate pieces and then left them on my design wall. I would move them around and when I was pleased I would connect them. I would add some more color here and there until I felt that the piece was completed... and voilà! "Looking for a wonderful way to nurture your creative soul? Join Sheila Frampton Cooper for one of her workshops. Sheila is a fantastic teacher with a beautiful spirit to match. She works with you and helps you to access your inner creativity. Sheila will help you explore design options, while learning tips for piecing and fabric placement. "I am a passionate about textile art. In one of the many online searches, I came across Sheila Frampton Cooper's works. It was 2015, I had never seen art quilts so interesting, rich and vibrant, like hers. The attractive design, the energetic colors was a discovery! I looked for her Internet address on Sheila's website and immediately wrote her an email asking her if she had published books on her quilting technique or if she was holding classes or workshops in Europe. To make a long story short, in 2016 with our Association “Roman School of Quilting”, on the occasion of the Arte Morbida exhibition, we had the joy of hosting her marvelous art quilts and a precious workshop in Rome. Quilters from all over Italy participated in a 3-day course full of information and techniques. Sheila is a sunny, welcoming and patient person. The course was infinitely interesting and useful for me as I learned to work with fabrics and colors in a structured way. Also to match the colors so that they produce a vibrant or calm effect, depending on the need. We worked on shapes, which seem random but that are actually studied in the final effect they produce. Personally I have also learned to sew the curves, which I was definitely complicated before! The course with Sheila gave me the opportunity to start doing art quilts in a personal and independent way, finding my artistic style.